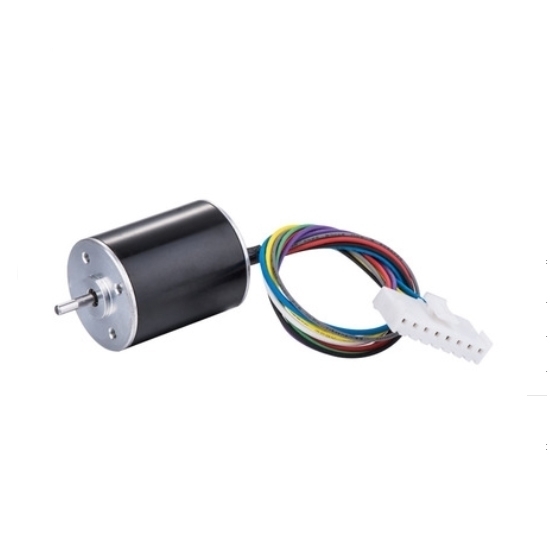 12V/ 24V 3 phase small electric brushless DC motor is 47W rated power, 4 pole, 17000 high rpm. The long life span offered by the brushless design can be exploited particularly well using preloaded NBM ball bearings. 17000 high speed BLDC motor with 3 phase 12 volt (24 volt) voltage, 47W, 26.3 mN.m rated torque. The design is intended to fill the need for a small motor with high performance and its external driver controller can change speed by PWM or 0~5V signal. Motor is the core component of the AGV car, the motor quality determines the performance of AGV. When selecting a motor, both DC brushless motor or DC brush motor are available. But according to the development trend of AGV , DC brushless motor is the major selection. Customer has made following performance tests for ATO DC brushless motor and other brands' DC brushless motors. When using other brands' DC brushless motors, the braking distance is 0.2m in emergency brake. But for ATO DC brushless motor, the braking distance is only 0.08m, partial brake reduced 60%. When using an ATO DC brushless motor, speed regulation cycle of two engines reduce from 3 turns to 1 turn under DC operation. When using an ATO DC brushless motor, the vehicle starts smoothly without stuck. Even when the customer put a coin on the vehicle, the coin doesn’t fall down at starting and stopping. When pushing the vehicle without powering on, the electricity generated would generally cause high voltage impact on the driver. We have already considered this factor when selecting drivers for customers, our vehicle fully avoid the high voltage impact.